Arrested for DUI in Pierce or King County? 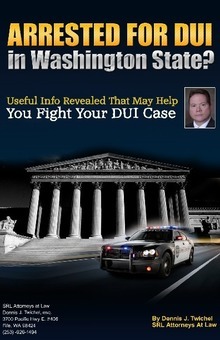 Download my free E-book that may help you Navigate your DUI Case in Washington State. ***Disclaimer*** Some of the information contained in this publication needs amendment due to recent changes in the law. Please contact Attorney Dennis Twichel for more information. Stop Sign, Red Light Tickets and Other Moving Violations. These Can Be Fought and Won! Got caught and now you wonder why your car insurance rates went up? The website insuranceQuotes.com is out this week with its annual review of nationwide rate increases. ▪ Get a speeding ticket in Illinois and your insurance is up a national high 98.65 percent. Get a ticket in Missouri, your rate has increased 9.3 percent. 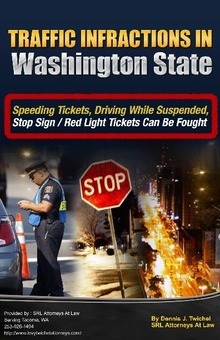 In Washington, look for a 21.07 percent increase due to a speeding ticket. The national average: 29.39 percent. ▪ Get convicted for reckless driving in Hawaii and you’ll see a nation-leading 290.68 percent increase. In Louisiana, the increase is pegged at 29.28 percent, the national low. In Washington, expect an increase of 57.75 percent if you are convicted of reckless driving. The national average: 84.5 percent. ▪ If you are convicted for driving while under the influence, expect a hefty 333.85 percent increase in North Carolina, with the nation’s heaviest hit. In Maryland, with the country’s lowest jump, expect an increase of 15.28 percent. In Washington, it will increase your car insurance premium by 57.54 percent. The national average: 94.32 percent. ▪ Nationally, expect an average 21 percent increase for a minor speeding violation (1-15 mph over the limit); a 19 percent increase for following too closely; likewise a 19 percent increase for failure to signal; and an 18 percent increase for improperly driving in an HOV lane. ▪ The least expensive increase to your premium will be due to your failure to wear a seatbelt, up 6 percent. “It’s no surprise certain moving violations result in bigger premium increases than others — and that’s because insurers have very specific data that show certain types of moving violations are more indicative of future risk,” said Eli Lehrer, president of the nonprofit research group R Street Institute. “It’s all up to how individual state insurance commissioners allow each company to assess rates,” said Dan Weedin, a Seattle insurance and risk management consultant, in the release. Should you be ticketed for a moving violation, insuranceQuotes.com offers tips on how to save money with your insurance. Among the tips: Seek forgiveness from your insurance carrier; or perhaps make a deal with the court, seeking forgiveness, a plea bargain or offering to take a safe-driving course.